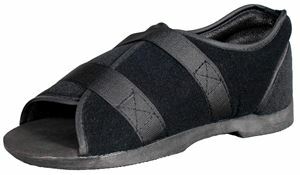 Softie shoe by darco is designed for the post surgery use. Features a semi-rigid metatarsal shank that provides control of forefoot moment. The upper cover is made of a padded tricot material that is breathable in nature. This keeps the shoe dry throughout the wear. The hook and looping system helps to fasten the straps easily with just one hand. Available in 3 sizes (Small, Medium and Large) of Women and 4 sizes (Small, Medium, Large and X-Large) of Men. Perfect shoe for those who work for more hours standing. I loved the shoe and it fits comfortably on my foot.